Maintaining the roads in a mine is sometimes an impossible task. Where mud and water isn't the big problem, you'll have dust and soft places. These water trailers can help you keep the dust down and maintain better compaction on your roadways. Uintah Machine manufactures water trailers for hauling large volumes of water into the mine for roadway maintenance or other purposes. Our water trailers are equipped with a pump and two or more adjustable spray heads for settling dust. We also build them with pneumatic brakes. Most of our water trailers are built with goosenecks for 5th wheel hitches. We'll build them smaller, as well, with pintle hitches or whatever is required. 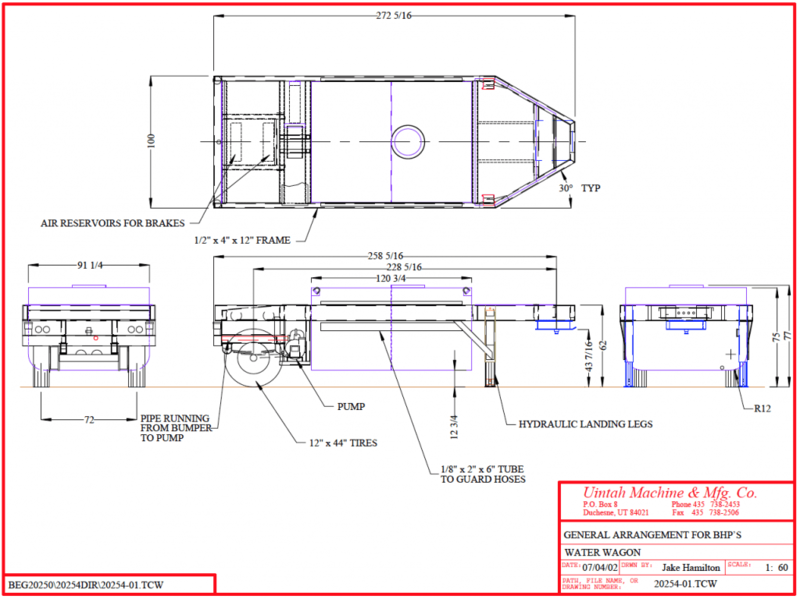 Uintah Machine has designed and built several styles of water tank trailers over the years. We can build one to fit your particular needs, as well. Email us or call us at 435-738-2453 to learn more.